Embalmed was formed in the early days of 1989, emerging from the dark streets of violence and death of Juarez, Mexico (check page status), as true heretics bound in demonic force the blood brothers : Anton venegas - Warconqueror666 - guitars/bass and Bruce venegas - Warlust666 - vox/drums set out to create a band of pure blasphemy and chaos to produce an extreme kind of music known as "Warsatanic Metal", relentlessly moving on trough the years up-holding the flag of heresy. 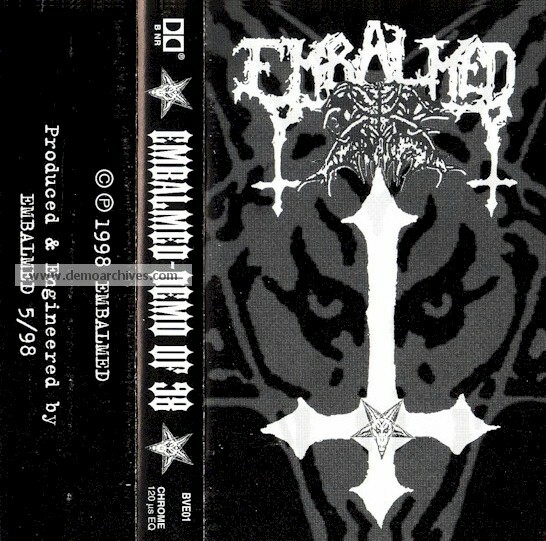 Embalmed released a complete CD with 7 satanic tracks plus intro & outro, titled "Unholy Torment" in the year 1998. 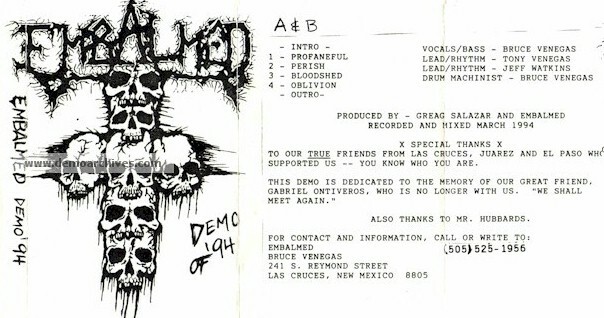 Information on all demo covers and tapes, also a correct bio - I believe they are an American band due to the address on the demo, but it could be a combo between Mexico since Las Cruces is very close to the border. Pro made covers and cassettes.